The legend of Ghost Hill dates to the early 1860s when Oregon was consumed by a gold rush. An old military trail that stretched from southern Oregon to Portland ran through what is now the Bayliss family farm. A miner was traveling the trail to Portland with a stash of gold and camped one night at what is now known as Ghost Hill. During the night, thieves killed the miner and stole his gold. The legend says that the miner’s ghost still wanders the hill looking for his stolen gold. The Ghost Hill Cellars Bayliss-Bower Vineyard is part of the family’s 234-acre property on Savannah Ridge in the Yamhill-Carlton AVA. The Bayliss family have been stewards of the land for more than a century. Initially, the farm was a dairy operation. When Samuel D. and Barbara Bayliss bought the farm in the 1930s from Samuel's father who came to the land in 1906 with his brother, they raised wheat, hay, clover, peas, sheep, and later beef cattle. Today, the vineyard is the only farm crop. Mike and Drenda Bayliss own the farm. 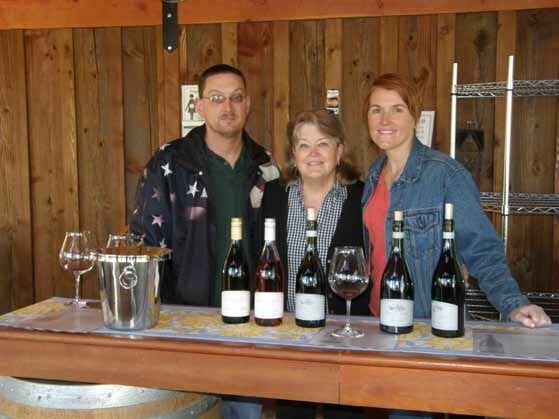 Their children, Mike Bayliss, Jr., and daughter Bernadette Bower along with her husband Cameron Bower own the Ghost Hill Cellars brand and vineyard together. The initial planting was in 1999, and today 15 acres of Pommard, Wädenswil, and Dijon 777, 114, and 115 are farmed. The vineyard has been managed by Buddy Beck of Advanced Vineyard Systems, Inc., since the beginning and is LIVE and Salmon-Safe certified. Some fruit is sold to other wineries including Lange and Elk Cove. The Ghost Hill Cellars wines, first released from the 2006 vintage, are 100% estate grown. The winemaker is Rebecca Pittock-Shouldis who had her first exposure to wine as an exchange student with a family living near Bordeaux, France. The host father was a wine collector and Rebecca was able to drink many older vintages of French wine, quickly falling in love with “tasting history.” She did not pursue a career in wine initially, instead she became a maintenance technician on F-15 fighter aircraft for the Oregon Air National Guard. In 2005, she left that job (although she remained a member of the Air National Guard) to enter the wine business. She did not have a formal winemaking education, but had a knack for crafting wine, and learned quickly. In 2008, she made her first wine for Ghost Hill Cellars, and the wines have become quite popular. The winery was chosen to participate in the 2012 International Pinot Noir Celebration, and Rebecca was panelist at the “Burgundy & Oregon: Parallels in Latitudes” Seminar at this year’s World of Pinot Noir. I met Rebecca, Drenda Bayliss and Mike Bayliss at the intimate tasting room adjacent the original farmhouse on the property. Mike Bayliss and son Mike, Jr., built the tasting room which has a sliding barn door and reclaimed windows from the Trappist Abbey Church in Carlton. 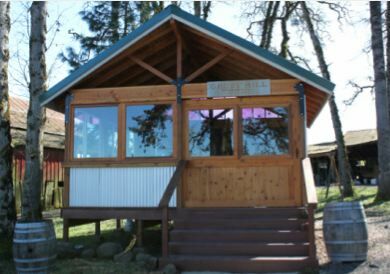 The structure is reminiscent of a prospector’s shack. From the weekend after Memorial Day through Labor Day, the tasting room is open Saturday and Sunday, and year-round by appointment. Visit www.ghosthillcellars.com for information and to purchase wine. Shown below are (right to left) Rebecca Pittock-Shouldis, Drenda Bayliss, and Mike Bayliss.